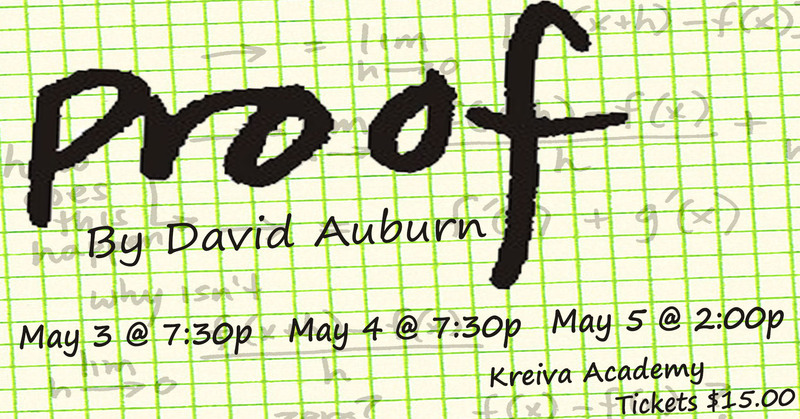 The spring production will be David Auburn's Tony and Pulitzer Prize winning play Proof.On the eve of her twenty-fifth birthday, Catherine, a young woman who has spent years caring for her brilliant but unstable father, Robert, must deal not only with his death, but with the arrival of her estranged sister, Claire, and with the attentions of Hal, a former student of her father's who hopes to find valuable work in the 103 notebooks that Robert left behind. Proofwill play Kreiva Academy May 3rd-5th. Proofis presented by special arrangement with Dramatists Play Service, Inc., New York.